Something about the style of illustration in this Halloween postcard, circa 1910, makes me think of children's picture books. I just see a story here, maybe something like "The Witch Who Came to Visit." Where has she come from, and why didn't she just fly, as would have been traditional? 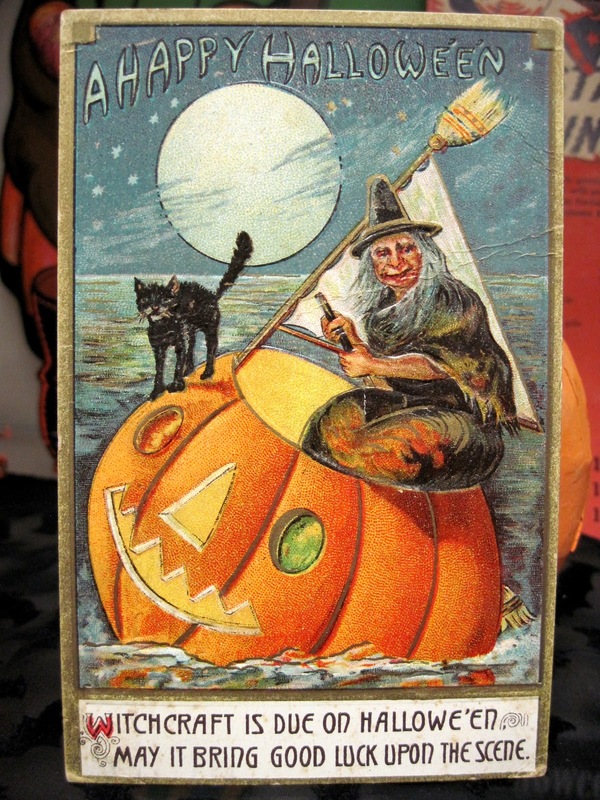 Where is she going, in her broom masted pumpkin boat? Is she a good witch or a bad witch? She's smiling, but I suppose that's not a sure thing: the witch in Hansel and Gretel was probably smiling warmly right up to the time she tried to cook and eat her little visitors. Is that cat safe? Why isn't he in the boat too? I'm worried he's going to fall off. And just how seaworthy is that pumpkin boat? Is there any danger of fish nibbling away the bottom? Won't water come through the face holes? Seems like a major design flaw there. This is definitely a postcard that raises lots of questions. And, as we know, witches melt when exposed to water. Excellent point: I forgot about that.